For the Christian reformer, see Martin Luther. Luther Martin (February 20, 1748, Piscataway, New Jersey – July 10, 1826 New York, N.Y.) was a politician and one of the United States' Founding Fathers, who refused to sign the Constitution because he felt it violated states' rights. He was a leading Anti-Federalist, along with Patrick Henry and George Mason, whose actions helped passage of the Bill of Rights. Martin was an early advocate of American independence from Great Britain. In the fall of 1774, he served on the patriot committee of Somerset County, New Jersey, and in December attended a convention of the Province of Maryland in Annapolis, which had been called to consider the recommendations of the American Congress. In 1785, he was elected to the Confederation Congress by the Maryland General Assembly, but his numerous public and private duties prevented him from traveling to Philadelphia. Martin was elected as a delegate to the Constitutional Convention of 1787 in Philadelphia. When he arrived on June 9, 1787, he expressed suspicion of the secrecy rule imposed on the proceedings. He also opposed the creation of a government in which the large states would dominate the small ones, he consistently sided with the small states, helping to formulate the New Jersey Plan and voting against the Virginia Plan. On June 27, Martin spoke for more than three hours in opposition to the Virginia Plan's proposal for proportionate representation in both houses of the legislature. He was known for his ability to talk and as stated by William Pierce "he was educated for the Bar … and he never speaks without tiring the patience of all who hear him." Martin served on the committee formed to seek a compromise on representation, where he supported the case for equal numbers of delegates in at least one house. Before the convention closed, he became convinced that the new government would have too much power over state governments and would threaten individual rights. Failing to find any support for a bill of rights, Martin and another Maryland delegate, John Francis Mercer, walked out of the convention. In November 1787, in a speech to the Maryland House of Delegates, he assailed the Constitutional Convention, not only for what it was attempting to do, but also for how it was going about the job. He broke the pledge to secrecy under which the convention had met and informed the Maryland legislators that the convention had violated its instructions to meet "for the sole and express purpose of revising" the Articles of Confederation. Instead, convention delegates had taken it upon themselves to make a fresh start by creating an entirely new system of government. To Martin, such an effort was akin to launching a coup d'état. George Washington and Benjamin Franklin had backed the change of direction of the convention, but, Martin said, we should not "suffer our eyes to be so far dazzled by the splendor of names, as to run blindfolded into what may be our destruction." In an address to the Maryland House of Delegates in November 1787 and in numerous newspaper articles, Martin attacked the proposed new form of government and continued to fight ratification of the Constitution through 1788. He lamented the ascension of the national government over the states and condemned what he saw as unequal representation in Congress. He owned six slaves of his own and opposed including slaves in determining representation and believed that the absence of a jury in the U.S. Supreme Court gravely endangered freedom. At the convention, Martin complained, the aggrandizement of particular states and individuals often had been pursued more avidly than the welfare of the country. The assumption of the term "federal" by those who favored a national government also irritated Martin. Maryland largely ignored Martin's warnings. In April 1788, it voted to ratify the Constitution, the seventh state to do so. In June, when New Hampshire became the ninth state to ratify, the required threshold had been reached, and the new Constitution took effect. Three years later, the first 10 amendments were added. Around 1791, however, Martin turned to the Federalist Party because of his animosity toward Thomas Jefferson, who, in 1807, spoke of him as the "Federal Bull-Dog." Martin's postwar law practice grew to become one of the largest and most successful in the country. The beginning of the 1800s saw Martin as defense counsel in two controversial national cases. In the first case, Martin won an acquittal for his close friend Supreme Court Justice Samuel Chase in his impeachment trial in 1805. Two years later, Martin was one of Aaron Burr's defense lawyers when Burr stood trial for treason in 1807. After a record 28 consecutive years as state attorney general, Martin resigned in December 1805. In 1813, he became chief judge of the court of oyer and terminer for the City and County of Baltimore. 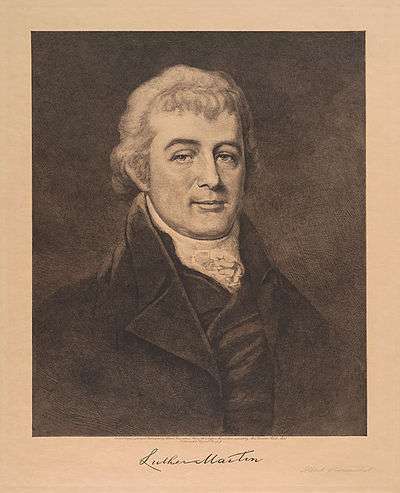 He was reappointed attorney general of Maryland in 1818, and, in 1819, he argued Maryland's position in the landmark Supreme Court case McCulloch v. Maryland. The plaintiffs were represented by Daniel Webster, William Pinkney and William Wirt. Martin's fortunes declined dramatically in his last years. Drinking heavily, illness, and poverty weighted heavily on Martin taking their toll as he aged. By the mid-1820s, he was subsisting on a special tax imposed on Maryland lawyers solely for his personal support. Eventually, he was taken in by Aaron Burr, whom he had defended at this disgraced ex-vice president's 1807 trial for treason. By this time, detestation of Thomas Jefferson, his one-time decentralist ally, led Martin to embrace the Federalist Party, in apparent repudiation of everything he had argued for so strenuously. Paralysis, which had struck in 1819, forced him to retire as Maryland's attorney general in 1822. On July 8, 1826, at the age of 78, he died in Aaron Burr's home in New York City and was buried in an unmarked grave in St. John's churchyard. His death came four days after the deaths on July 4 of Jefferson and John Adams. Martin married Maria Cresap (daughter of Captain Michael Cresap) on Christmas Day 1783. Of their five children, three daughters lived to adulthood. Kauffman, Bill, Forgotten Founder, Drunken Prophet: The Life of Luther Martin. Wilmington, DE: Intercollegiate Studies Institute, 2008; ISBN 978-1-933859-73-6. Crawford, Alan Pell, "Bookshelf: Uncouth, Unheeded" The Wall Street Journal, September 22, 2008, p. A21. Reynolds, William L., "Luther Martin, Maryland and the Constitution", 47 Maryland Law Review 291 (1988). Paul Clarkson and R. Samuel Jett, Luther Martin of Maryland (1970). Albert J. Beveridge, Life of John Marshall (4 vols., 1916–1919). Martin's role in the Constitution struggle may be traced in Max Farrand, ed., The Records of the Federal Convention of 1787 (4 vols., 1911–1937; rev. ed. 1966). "Delegates to the Constitutional Convention: Luther Martin." 2015. This article incorporates text from a publication now in the public domain: Chisholm, Hugh, ed. (1911). "article name needed". Encyclopædia Britannica (11th ed.). Cambridge University Press. This article is issued from Wikipedia - version of the 9/17/2016. The text is available under the Creative Commons Attribution/Share Alike but additional terms may apply for the media files.